A natural herbal concentrate for the stimulation of Fire-element organ function within the Energyvet Pentagram scheme. It acts through a mild excitation of the heart, small intestine, hormonal system and blood vessels, stimulating these organs or tissues towards increased activity. The product generally improves transport procedures within the animal's body on the organ, cellular as well as biochemical level. It improves blood supply to tissues. Bio-information of the product-specific homeopathic type complements and potentiates the effect of the included herbs. It stimulates the function of organs and tissues of the following element of Earth, i.e. of the nervous system, stomach, spleen and pancreas, and it provides nourishment for cellular growth and recovery. It calms down excessive energy and hyperactivity of the preceding element of Wood, i.e. of the liver, gall bladder, adipose tissue, and joints. - Immediately after myocardial infarction and stroke to support the blood supply into the affected tissue (administer for the minimum of 2 days) [Omegavet, Fytovet]. - Spasms, tic, and epilepsy of any aetiology [Fytovet, Etovet]. - The spleen (blood cell production) [Imunovet]. - The pancreas (digestive enzyme production) [Fytovet]. - The nervous system, if weakened (depressions may alternate with hyperactivity) [Etovet]. - Tissue recovery through blood supply [Imunovet]. - Liver or gall bladder problems with increased temperature [Imunovet]. - Joint inflammations (painful, hot) [Skelevet]. - It calms down aggressiveness [Etovet]. - It enhances joy of life [Omegavet]. Herbal extract 82.6% (Ginkgo biloba, Hypericum perforatum, Tabebuia impetiginosa, Sanguisorba officinalis, Aesculus hippocastanum, Medicago sativa, Viola tricolor, Centaurea cyanus, Echinops sphaerocephalus, Menyanthes trifoliata, Lavandula officinalis, Quercus robur, Allium sativum, Carum carvi, Vaccinium vitis-idaea, Anethum graveolens, Zingiber officinale), sorbitol – thickener, microcrystalline cellulose – thickener, water, xanthan – thickener, grapefruit extract – preservative, potassium sorbate – preservative, mixture of essential oils 0.12%, bioinformation for Korovet. Do not administer for more than 2 days in cases of any cardiac problems, venous and arterial inflammations. Do not exceed the recommended daily dose! Ensure sufficient intake of water in the course of product usage. Not suitable for gestating females. Keep out of reach of children! 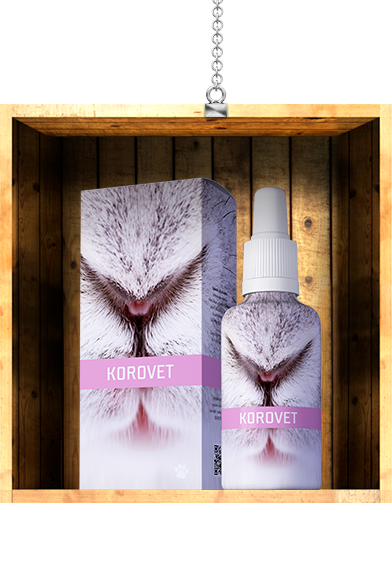 I use Korovet particularly for the management of most epileptiform or convulsive conditions without the necessity of other medication. Its temporary use is a benefit. If used in older animals, it also helps to enhance the animal's stamina.